In 2003, Saint-Gobain adopted the Principles of Conduct and Action, formally defining the values that have guided the Group over time. The Principles of Conduct and Action form the foundation stone of the Group's values. They apply to all Group employees and for dissemination purposes are available in more than 30 languages. The extremely strong adherence to these values is a key factor of Group cohesion in a global framework. The Principles of Conduct and Action incorporate the ten universal principles of Global Compact in the area of human rights, labor rights, environmental rights and the fight against corruption. They explicitly refer to applicable ILO conventions, the OECD's Guiding Principles for multinational businesses and the OECD convention with regard to combatting corruption. The implementation of the Group's strategy is reflected by policies and commitments that are applied by the Sectors, Activities and General Delegations. First among these are the "reference policies". 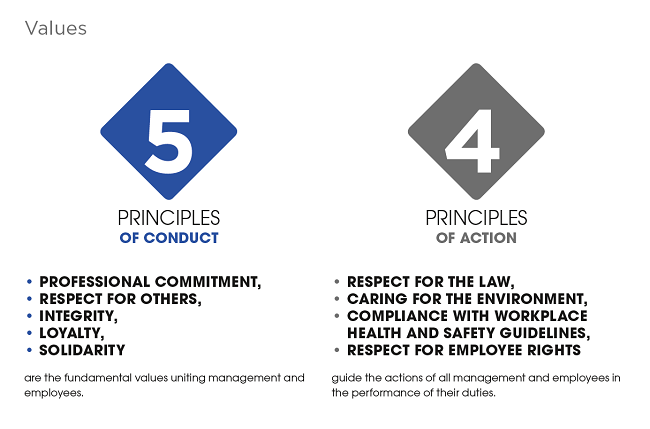 These stem directly from the Principles of Conduct and Action and define the principles of management applicable to all Saint-Gobain entities and employees. Saint-Gobain's CSR approach is supported by the Principles of Conduct and Action and the reference policies.